Valentine’s Day is all about showing affection and appreciation for loved ones, and while a box of chocolates is tasty, sometimes people want to give something more meaningful. Empower donors to show their family and friends they care—not only for them, but for a worthy cause—by allowing them to send eCards alongside gifts made in honor of their loved ones. With Classy’s Pro Plan, you can use the eCards feature to allow donors to send a personalized message along with their dedicated gifts. In fact, the ability to send a tailored, beautiful note can encourage supporters to make more donations in honor of friends and family. To get you started, we’ll explain how and why nonprofits should use eCards. Then we’ll offer some tips for designing eCards for your campaign and finish up with a short tour of how to use eCards on Classy. Why eCards and Not Email? As the name suggests, an eCard is a digital alternative to a greeting card or postcard. 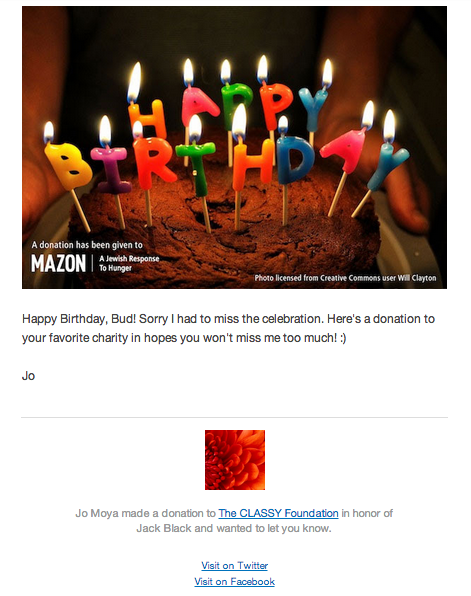 You may be wondering how allowing donors to send an eCard is any different from a dedication email, but the answer is simple: eCards allow your donors to personalize your cause in a highly stylized and branded way. Think of it as the difference between getting flowers with a typed note from 1-800-Flowers versus delivered with a handwritten card. Your eCards can deepen the meaning of a donation to both the donor and dedicatee, which is a huge plus for a supporter’s personal experience with your organization. Like greeting cards, the value of your eCards isn’t limited to holidays. You can update your design offering to match different seasons, cause awareness days, or keep more permanent options that reflect occasions that happen year-round, such as birthdays, weddings, and engagements. To serve as a holiday or birthday present for the honoree. They can then find out more about the organization and potentially become a supporter themselves. To tell someone you made a gift in their honor. 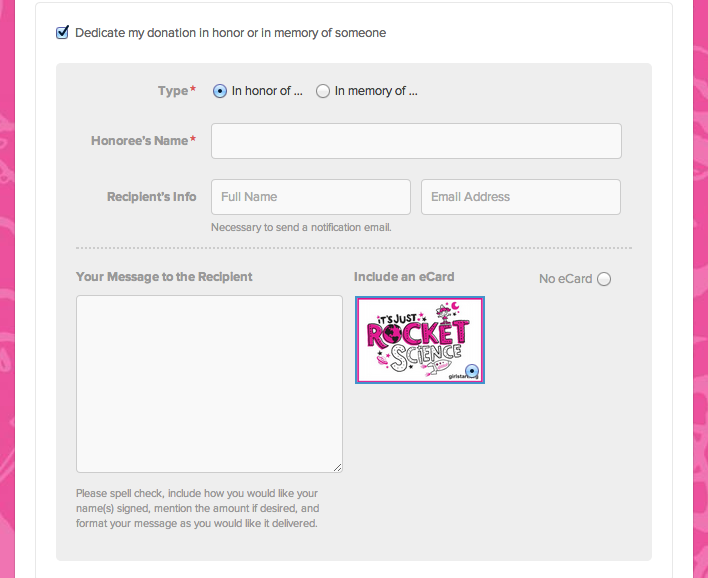 You can use an eCard to let someone know their association with the cause inspired you to give. To challenge the recipient to pass it on. Viral fundraising a la the 2014 ALS Association’s Ice Bucket Challenge highlights the potential behind challenging or personally asking someone to donate. 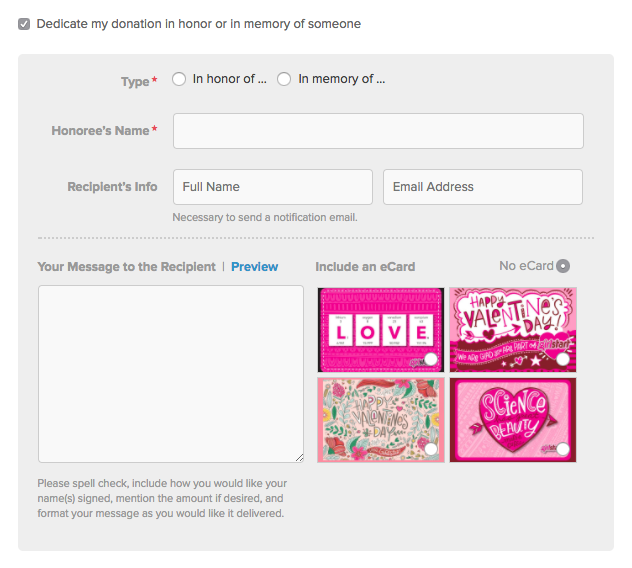 Donors can send an eCard asking the recipient to give to the cause. If successful, this could turn one gift into many. However you choose to use your eCards in your fundraising efforts, you are making your cause and campaign more social, shareable and, most importantly, personalized. Before your donors can send them, you’ll need to make your own eCard. If you don’t have Photoshop skills or a graphic designer on hand, don’t worry. There are plenty of apps that include easy-to-use templates to create beautiful graphics—sometimes even for free. Check out Canva, for example. This is the picture or background of the card. You can make it holiday-themed or choose a photo showing your organization’s work. Consider showing the progress your mission supports or the people you have helped. If you want to emphasize that this is a holiday campaign, for example, consider your audience and whether they would prefer a secular or religious theme. Make sure your design features your organization’s logo. You want the recipient to know where the gift is going. This doesn’t just promote your brand, it also makes the eCard look more professional. Make sure to consider the colors, font, and voice of your brand when designing eCards. For a detailed technical guide to crafting great nonprofit branding, read this guide by Brandisty. Because the text should be short and simple, be thoughtful and deliberate with the copy. You can add a standard thank you, a simple phrase that represents your cause’s ethos, or a line that demonstrates the impact a donation makes on your organization’s programs. Regardless of how you structure your eCard, make sure that at least some piece of the design demonstrates your cause and the impact donations have on it. Your imagery and messaging should match the how, what, and why of your organization. We love these Valentine’s Day themed examples from GirlStart, an organization that empowers girls through STEM (science, technology, engineering, and math). Let’s take a quick look at our eCard tool (for a deep dive and how-to, check out our thorough support article). Starting from the “Fundraising” tab on your dashboard, click on the “Manage” button next to the campaign on which you want to use the tool. Go to the “Edit” tab and click on the “Donation Page” option. Scroll down until you see the “Dedications Settings.” Expand this section and click to allow dedications and offer eCards to donors. Now all you have to do is upload your eCard images! Just click on the plus sign (+) in the image box. Donors will be able to add a personalized message and then preview before they complete their donation and send their eCard. eCards are a great way to supplement your fundraising efforts no matter the time of year. Remember that delighting donors and providing a personalized experience can go a long way in making a lasting impression with supporters (and those they send dedications to). Do you currently use eCards? Share your favorite designs with us on Twitter @classy or Facebook @classy.org.